An eagle string art pattern has been added to the String Art Fun website. The pattern size is approximately 300 mm x 210 mm (12 x 8½ inches). It is delivered by download to your computer in PDF format. The pattern is in the general section of the String Art Fun website under Eagle. This entry was posted in String Art and tagged String Art Fun on Saturday 10 May 2014 by David Jefferson. A jam string art pattern has been added to the String Art Fun website. The design features a jar of strawberry jam. The pattern is in the general section of the String Art Fun website under Jam. This entry was posted in String Art and tagged String Art Fun on Sunday 4 May 2014 by David Jefferson. A wine bottle string art pattern has been added to the String Art Fun website. The design features a wine bottle with a glass of wine. The pattern is in the general section of the String Art Fun website under Wine bottle. This entry was posted in String Art and tagged String Art Fun on Thursday 1 May 2014 by David Jefferson. String Art Fun customer Marge Burns sent us this picture made from the free shell pattern. Instead of using it the regular way with nails and such, Marge made it into a card with embroidery floss and then added gems. The pattern was used at full size. This entry was posted in String Art and tagged free pattern, String Art Fun on Monday 17 December 2012 by David Jefferson. 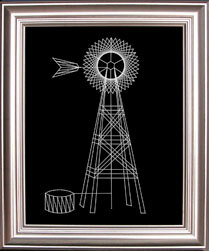 A windmill string art pattern has been added to the String Art Fun website. The pattern can be worked in silver string, thread, wool or thin wire on a black background. The pattern is in the general section of the String Art Fun website under Windmill. This entry was posted in String Art and tagged pattern, String Art Fun on Thursday 1 December 2011 by David Jefferson. 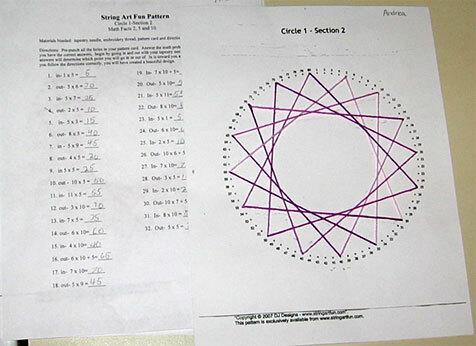 An article on the String Art Fun website describes a way of using string art as a fun way to teach math to second or the third grade pupils. The children are given a sheet of multiplication sums to solve. Once they have the answers they can use them to create a geometric design. The design can be either drawn on a supplied template, stitched on card using thread and an embroidery needle or created on a board with nails and string. For more details and a sample work sheet visit the Notes for teachers section of the String Art Fun website. This entry was posted in String Art and tagged String Art Fun, teaching on Saturday 24 April 2010 by David Jefferson. Make a picture for your loved one with the free heart circle string art pattern to be found at the String Art Fun website. The design, that creates a heart within a circle, was inspired by a curve stitching pattern based on a mathematical formula. As well as creating this heart circle with nails and string you can also create it as a greetings card with a pattern from the Pinbroidery website. This entry was posted in String Art and tagged pattern, String Art Fun on Friday 29 January 2010 by David Jefferson.